So last week, there was an article about how Creative can influence Design. First off, on behalf of Creative, thank you for not flooding our inboxes with demands for the most random of card ideas. Lest you think that we are able to get any crazy idea through, let me assure you that this is not the case. This is probably best demonstrated in a card you’re getting today. Or rather, not getting today. The Fantine, a ship for the Maquis. My first thought for this ship was to make it the U.S.S. Voyager. There were a number of factors going into this, but first and foremost was the story. The Maquis did take over Voyager in the seventh season, and had previously discussed it plenty of times. Not only that, they had enough time to change out of the Starfleet uniforms into their Maquis outfits. If they did that, they probably reprogrammed the ship so that it couldn’t be taken over, changed all the passwords, modified the letterhead, etc. Beyond that, there were gameplay reasons. First, the Maquis don’t have big ships. They have the Defiant, but that’s about it. This would give them another big ship to play with along with the Defiant and their smaller ships (they don't have many other options storywise). For ten years, we've only had a single version of Voyager. Heck, we even have two versions of Deep Space Nine! But the signature ship of the fourth live action series has only one card. There's not really a great reason for there to be another, especially from a gameplay perspective. Voyager does what it does fairly well. So at the Creative meeting with Tyler, I asked for this change to be made… and got a firm no. In the interest of accuracy and fairness in reporting, he didn’t yell, throw anything or display any rudeness or any other attitude but professionalism. In fact, he expressed some very good reasons why it couldn’t be Voyager. First was a staffing concern. At two command stars and two staffing stars, this was much harder to staff than they typical singular command star that the Condor class requires. It’s not as bad as the Defiant, but it is up there. Now, the Maquis aren’t short on command stars, but this was a huge gap for them to overcome. But beyond that, this would be giving the Maquis access to a few cards outside their faction. 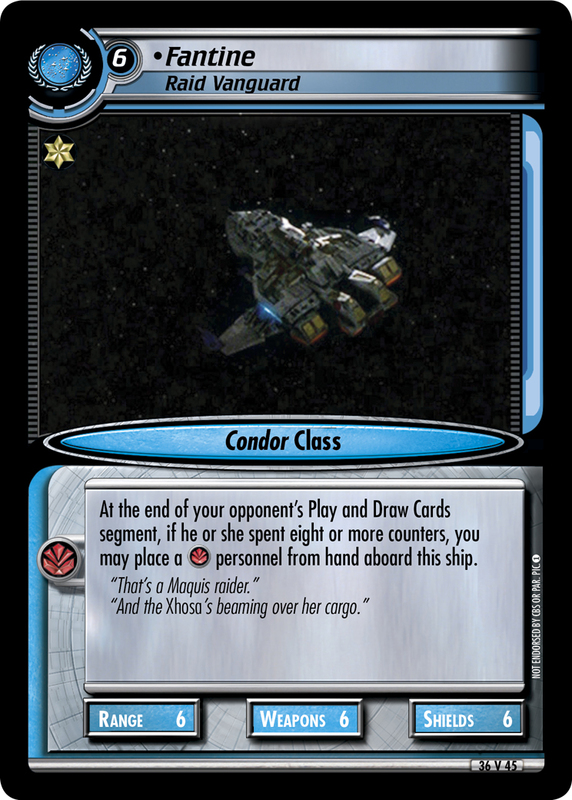 With Captain on the Bridge, it wouldn’t be too hard for the Maquis to have access to multiple Voyager icon personnel, and from there, access to cards that can play with three of those icons in play. This is something that Design is trying to avoid if at all possible. While it is not insurmountable to get Voyager icon personnel in play, a Maquis-icon Voyager would practically be begging players to find an abusive deck that could exploit the interaction. Yes, the Borg do have the Enterprise-E, but there is only one corresponding Commander of that ship, Picard. The mere existence of the Ferengi Enterprise-D held Design back for years in releasing a third commander of that vessel. While there were plenty of options for another Commander of the -D, Design was well aware that the gameplay implications could get very nasty very quickly. It’s not that we’ll never get a Voyager for the Maquis. The pressing concern is that there needs to be careful consideration before Design is ready to commit to a card that represents a significant metagame threat. By the time Creative gets the card, it's usually too late for that big of a change. Until then, enjoy the Fantine.